Top view of the crystallographic structure of a homodimer of the NFKB1 protein (green and magenta) bound to DNA (brown). 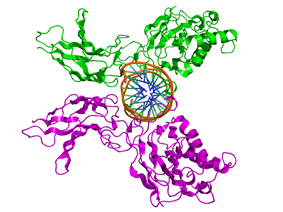 The Rel homology domain (RHD) is a protein domain found in a family of eukaryotic transcription factors, which includes NF-κB, NFAT, among others. Some of these transcription factors appear to form multi-protein DNA-bound complexes. Phosphorylation of the RHD appears to play a role in the regulation of some of these transcription factors, acting to modulate the expression of their target genes. The RHD is composed of two immunoglobulin-like beta barrel subdomains that grip the DNA in the major groove. The N-terminal specificity domain resembles the core domain of the p53 transcription factor, and contains a recognition loop that interacts with DNA bases. The C-terminal dimerization domain contains the site for interaction with I-kappaB. ^ Wolberger C (October 1998). "Combinatorial transcription factors". Curr. Opin. Genet. Dev. 8 (5): 552–9. ^ Anrather J, Racchumi G, Iadecola C (January 2005). "cis-acting, element-specific transcriptional activity of differentially phosphorylated nuclear factor-kappa B". J. Biol. Chem. 280 (1): 244–52.